In one of my trips to Oaxaca, Mexico, in the early 2000's, an acquaintance told me the following story. A group of people from a remote hamlet were planning to build a road. A delegation converged on the mayor of town to solicit his help. The mayor offered them a bulldozer and a few picks and shovels. He also mentioned that he would send an engineer. At that point, the head of the delegation said: "An engineer? What for? We haven't used one before." The mayor explained that the engineer would help them to find where to put the road. The head of the delegation answered promptly: "In the past, when we needed to build a road, we just let a burro loose, and he would show us the best possible route." Thus, the moral of the story: A burro's natural instinct can work engineering wonders. 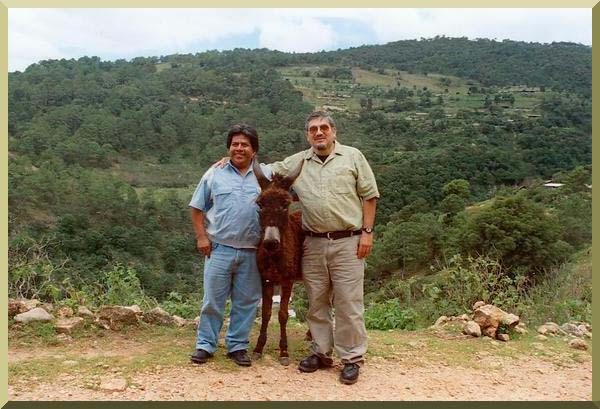 With my friend Jose Perez, D.V.M., and a local burro in the hills of Tlaxiaco, Oaxaca, c. 2003.